Americas gateway to the universe. Leading the world in preparing and launching missions to Earth and beyond. March 7, 2003John F. Kennedy Space Center Spaceport Newshttp://www-pao.ksc.nasa.gov/kscpao/snews/snewstoc.htmVol. 42, No. 5(See HISTORY, Page 6) Inside Page 8  OSB II ribbon cutting. Page 3  Special exhibits at KSC Visitor Complex. Page 2  Recognizing Our People honors employees. Page 5  Public invited to preview Mars Rover mission.Students pay respects to Columbia crewSixth grade classes from the namesake of our fallen orbiter, Columbia Elementary School, visited Kennedy Space Centers Visitor Complex Feb. 21 to honor the STS-107 Crew. The 100 Palm Bay students participated in an afternoon of dual-purpose activities. Not only did they gently remember the heroic astronauts, but they were also encouraged to fulfill the crews unanimous hope  to continue exploring Space despite challenges, and now, fears. Kirstie McCool Chadwick, STS107 Pilot William Willie McCools sister, provided a human connection to the lost crew for the caring students. She discussed her brothers childhood and family life, and explained Willies academic and professional background. 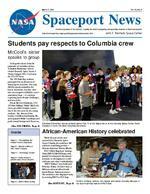 However,McCools sister speaks to group(See COLUMBIA, Page 3)African-American History celebratedWhile the past weeks were sorrowful for Kennedy Space Centers family, the workforce did celebrate something positive  African-American History Month. KSCs Black Employee Strategy Team (BEST) filled February with morale-boosting and educational activities so all employees could celebrate each others individuality. BEST Fridays were held each February Friday. On these days, a different cafeteria offered traditional African-American entrees. The workforce also displayed unity by wearing BEST or KSC logoPage 4  Technology transfer.Columbia Elementary School students gather Feb. 21 at the Space Mirror at the Kennedy Space Center Visitor Complex to honor the fallen Columbia astronauts. NASAs Kimberly Jenkins, Ken Aguilar and James Kennedy take part in the Soul Food Fest held at KARS II Park.  NASAs technical assistance to establish a new contract for nitrogen tetroxide when the sole source supplier discontinued production under bankruptcy proceedings was the primary reason for the award. Chuck Davis, our core technical expert on hypergols, led the technical effort on inventory assessments, market research, and new source selection. Nitrogen tetroxide is an oxidizer used in many launch and attitude propulsion systems and is critical to national defense as well as NASA and commercial space programs. Jim Hattaway, H. T. Everett and Chuck Davis, who are part of the KSC OP/TA Principal Center for Fluids Acquisition and Management Team, represented NASA/ KSC in accepting the award. NASA/KSC was nominated for the award by Sharon Murphy, director of Aerospace Fuels, Defense Energy Support Center in San Antonio, Texas. NASA obtains nitrogen tetroxide, hydrazines and kerosene-based jet and rocket fuels from DLA/DESC, rather than have separate NASA contracts.January 2003 Employees of the Month are (back row from left) Ronnie Rodriguez (UB), Chuck Jenkins (PH), and Chris Pino (PH), and (front row from left) Laura Thayer (BA), Lynn Barnette (QA), Virginia Cummings (YA) and Gail Hebert (TA). Not shown is Tricia Moran (VA). February 2003 Employees of the Month are (back row from left) Carlos Calle (YA), Rodney Brown (TA), James Myers (VA) and Dave Stewart (UB), and (front row from left) are Adrienne Ulmer (MK) and Al Diaz (PH). Not shown are Joan Lyons (GG) and Connie Milton (XA). The Defense Logistics Agency named NASA KSC Customer of the Year. Pictured third from left is the Director of the DLA, Vice Admiral Keith Lippert, who presented the award to NASA team members (from left) Jim Hattaway, Chuck Davis and H.T. Everett. SPACEPORT NEWS Page 3 March 7, 2003COLUMBIA ...(Continued from Page 1)its likely the most beneficial and productive aspect was offering an open environment for audience questions. Talking to kids is a big part of an astronauts job. It was by far my brothers favorite thing, she said. Im here to continue his passion. Before presenting Columbia Elementary with a print of the McCool familys autographed STS-107 Crew photo, she shared her favorite memory about growing up with her brother. We used to play Dungeons and Dragons all the time, she said. He always wanted to be the Dungeon Master because it meant he was in charge. Understanding the magnitude of the tragedy, students articulated the bittersweet mood of their trip. Student Jasmine Haralson said, I cant be really happy to be here, but I am looking forward to learning more about the shuttle. Similarly, 6th grader Candace Hamil expressed, Lots of people are jealous we are here. But its kind of sad. Focusing on the future of exploration, KSC Educator Resource Center Representative Laura Colville explained aerospace career paths. Her science demonstrations received stunned oohs and ahhs that sounded as if they were prerecorded. Colville also offered advice. Find something you really like and pursue it, she said. Listen to and surround yourself with positive people. Afterwards, the group ate a pizza lunch at KSCVCS Lunch Pad, where each received single stem flowers. They then remembered the crew with not only their presence, but by also placing the red, white and blue carnations at the Astronaut Memorial and observing a silent moment. To make the final attempt of the day to reassure and encourage our future generation of explorers, the visit ended with the exhilarating Space Station IMAX movie. Ive always known [space flight] was dangerous and Im upset, but I think the astronauts would like it if we went on with space travel, said student Lukas Termini. While the NASA family wants the message behind the visits positive discussions and activities to come across to all, its clear it made an impression on at least one child.Outpouring of support continues Public shows of sympathy and concern over the Columbia tragedy continue. At top Congressman Dave Weldon (second from right) showed his concern by visiting Kennedy Space Center. He is is pictured looking over the pieces of Columbia debris stored in the RLV Hangar. At his right is Steve Altemus, Space Shuttle test director. Accompanying Weldon are (from left) Center Director Roy Bridges and External Relations and Business Development Director JoAnn Morgan. PIctured above right, Space Gateway Support staff move a pallet of popcorn donated by the Weaver Popcorn Co. and the Local Councils of The Boy Scouts of America. The group sent 28 pallets of popcorn, about 2,000 boxes, to KSC with a note that they share in our sorrow. Above left, The Little Patriot, PJ Nastasio, presented his Space Shuttle model to Dr. Sam Durrance during the Ovenright Adventure Program Feb. 15. PJ said that the Shuttle was being presented to Durrance to accept for the Visitor Complex on behalf of all of the astronauts who have given their lives on behalf of space exploration and to commemorate his grandfather, who worked as project manager for Technelux at KSC for more than 30 years. Durrance accepted the Shuttle and encouraged PJ and all 270 scouts, family and leaders in the audience to continue to support space exploration and pursue careers in science and math. He told all the scouts that of the almost 300 flown astronauts, almost 200 of them were involved in scouting at one point in their lives, and approximately 40 astronauts have received the honor of Eagle Scout. The scouts came from areas throughout Florida and one troop came from South Carolina. They ranged in age from 8 to 14 years old. Page 4 SPACEPORT NEWS March 7, 2003 KSC patents and licensing opportunitiesDuring calendar year 2002, KSCs Technology Commercialization Office received 158 New Technology Reports (NTRs) for innovations developed here at the Center. These include patent and copyright licenses, cooperative agreements, and reimbursable and nonreimbursable Space Act Agreements. A sample of some of KSCs recent patent and license awards and license offerings:On Oct. 8, 2002, U.S. Patent No. 6,462,684 was awarded for the Advanced Self-Calibrating, SelfRepairing Data Acquisition System (ADAS, KSC-12301). A team of innovators that includes Angel Lucena and Jose Perotti of NASA along with Anthony Eckhoff and Pedro Medelius of ASRC developed the technology, which has been licensed for commercialization by Circuit Avenue Netrepreneurs of Camden, N.J.The talents of innovators Louis MacDowell and Joe Curran resulted in the filing of U.S. Patent Application 60/253,069 for the technology Liquid Galvanic Coatings for Protection of Imbedded Metals (KSC-12049) on Oct. 15, 2001. Focused marketing and technical interchange meetings at the 2002 NASA Advanced Materials Symposium in Cleveland last May resulted in a technology licenseRegister for April 29-May 1 Space Congress The 40th Annual Space Congress, sponsored by The Canaveral Council of Technical Societies (CCTS), is set for April 29  May 1 at the Radisson Resort in Cape Canaveral. This annual event provides a forum for space professionals to meet and share their knowledge of technical areas and issues facing the space program. This years Space Congress celebrates the rich history of the early space program and the exciting future advances that lie ahead as we continue to expand our technology and knowledge  redefining space transportation and the frontiers of the universe. The 40th Space Congress marks several milestones recognizing the Kennedy Space Center, which celebrates 40 years as a NASA Center, as well as the 100th anniversary of flight. The event will host four days of technical paper and panel sessions and exhibits, and commemorates space exploration with the theme Linking the Past to the Future  a Celebration of Space. This international conference, aimed primarily towards professionals in the business of space, is gathering a large portion of the aerospace community to discuss current and future space activities around the world. Panel sessions and paper presentations will address how the combined efforts of the scientific, commercial, military, and educational communities contribute to the growth of knowledge and understanding of space and to the well-being of humankind around the world. CCTS created Space Congress in 1962 to stimulate interest and promote professionalism in the space program. Space Congress is organized in cooperation with NASA, the Department of Defense, industry and academia. The annual event provides a forum for space professionals to meet and share their knowledge of technical areas and issues facing the space program. For more information and to register, visit www.spacecongress.org or call (321) 868-1623. Pictured from left are Angel Lucena, NASA, (seated); Pedro Medelius, ASRC; Jose Perotti, NASA; and Anthony Eckhoff, ASRC. The innovators developed the Advanced Self-Calibrating, Self-Repairing Data Acquisition System technology.agreement that became effective Nov. 8, 2002.The Patent and Trademark Office announced the issue of U.S. Patent 6,487,866 on Dec. 3, 2002, for the technology Multipurpose Thermal Insulation Test Apparatus (KSC12108). Congratulations to the inventors James Fesmire and Stanislaw Augustynowicz.U.S. Patent No. 6,512,536 was issued Jan. 28 for the technology Cable and Line Inspection Mechanism (CLIM, KSC-12023). The inventor is Terence Ross, a former NASA employee who now works for CISCO Systems Inc, in N.C. NASA has nonexclusively licensed this technology to Longview Inspection Inc., Houston, Texas.Currently NASA KSC is seeking to license a sensor that measures the total mass of cryogenic fluid in a flight or storage tank. The Mass Sensor for Cryogenic Fluids was developed at the KSC to measure the mass of fluids in space vehicle fuel tanks prior to launch. Theoretical and experimental evidence implies that the accuracy of this sensor will be within plus or minus 0.5 percent of the full-scale reading for select pressure and temperature ranges and can be applied to tanks of nearly any size and shape. The device was developed to address the need for densified cryogenic propellants on future launch vehicles. Densified propellants allow greater amounts of fuel and oxidizers to be placed into onboard tanks.KSC is also seeking to transfer the NASA-developed Nonintrusive Cable Tester technology to private industry for use in industrial applications. This technology was developed at KSC to provide a reliable, portable, ultrasensitive and nonintrusive method of verifying the condition of cables inside the Space Shuttle orbiter. It is unique compared to existing systems in its ability to detect a signal under the presence of strong noise and its use of digital quadrature demodulation, integrating circuitry, and digital signal processing to further increase sensitivity.NASA is seeking to license a capacitive detector that can be scanned over the ground and detect leaks in underground pipe. Using a method that can be implemented with relatively simple electronic circuitry, this device provides a capability for detecting leakage of an electrically conductive liquid from an electrically nonconductive underground pipe. The device was developed as a simple and inexpensive method for locating leaks and is also useful in locating the pipes themselves. Page 5 SPACEPORT NEWS March 7, 2003 Public invited to preview Mars Rover missionNASAs Family & Community Mars Exploration Day, pictured above, was held Feb. 19 at the Radisson Resort at the Port in Cape Can averal. At right, James Garvin, NASA lead scientist for the Mars Exploration Program, talks to students about the two Mars Exploration Rov ers set to launch in May and June. Garvin is standing next to a replica of a Mars Exploration Rover. The event informed students and the g eneral public about Floridas key role as NASAs Gateway to Mars and offered an opportunity to meet with scientists, engineers, educators a nd others working Mars exploration missions. The Mars Exploration Rovers are being prepared for launch aboard Boeing Delta II rockets fro m the Cape Canaveral Air Force Station. The Mars Exploration Rover mission is part of NASAs Mars Exploration Program, a long-term effort of robotic exploration of the red planet. The program seeks to take advantage of each launch opportunity to go to Mars, which comes around every 26 months as the planets move around the Sun. Scheduled for two separate launches between May 30 and July 12, 2003, the two rovers will be delivered in landing craft to separate sites on Mars in January 2004. Primary among the missions scientific goals is to search for and characterize a wide range of rocks and soils that hold clues to past water activity on Mars. The spacecraft will be targeted to sites that appear to have been affected by liquid water in the past. March 7, 2003 SPACEPORT NEWS Page 6HISTORY ...(Continued from Page 1)NOAA Weather Radio can be a lifesaverThe strong tornado season in central Florida begins in February, peaks in March, and dissipates in April. A NOAA Weather Radio can help you be better prepared. NOAA stands for the National Oceanic and Atmospheric Administration. Many of our strong tornadoes in this season occur late at night. Can you hear the siren while deep asleep at 3 am? The alarm from a NOAA Weather Radio by your bed will definitely awaken you. Alternatives for the hearing and visually impaired are also available. NOAA Weather Radio sounds an alarm whenever National Weather Service issues a warning for weather emergencies in your area, including tornadoes. NOAA Weather Radio also gives you other useful weather information, including weather watches, weather advisories, the current local weather forecast, and non-emergency alerts such as for rip currents. This helps you schedule outdoor activities to avoid weather hazards. Scheduling your outdoor activities to avoid thunderstorms is important since lightning kills more than all other weather combined in Florida. NOAA Weather Radio is an all hazards alert system and is linked to the Emergency Broadcast System. It broadcasts warnings of all emergencies, not just weather hazards. This includes natural emergencies, like runaway wild fires, and manmade hazards, like chemical spills. Local terrorist attacks would also be broadcast, so NOAA Weather Radio can help you better participate in Homeland Defense. All mariners should have a NOAA Weather Radio on their boats. You can use the latest forecast to see if the weather is safe and keep apprised of changing conditions. Most importantly, NOAA Weather Radio will broadcast any National Weather Service Small Craft Advisories within seconds, giving you the maximum time to get to port. However, NOAA Weather Radio only has a range of 30-40 miles. Most electronics stores and even department stores sell NOAA weather radios. Cost typically ranges from $15 to $75, depending on what features are included. One very useful feature is Specific Area Message Encoder (SAME). This allows you to filter out warnings that dont affect your county, i.e., you wont get a blaring alarm for severe weather warnings one or more counties away. The Melbourne and Daytona Beach transmitters both serve Brevard County. Most of the county is best served by the Melbourne frequency, but the northern parts of Brevard might get better reception from the Daytona Beach transmitter. All you need to know about NOAA Weather Radio, including how to program the SAME countyspecific feature, is available at www.srh.noaa.gov/mlb/nwr1.html. shirts on BEST Fridays. Employees looking for a romantic Valentines weekend event didnt look long. The Feb. 15 formal Souls of Black Folk gala at the Radisson Resort at the Port welcomed 250 partygoers. For $30, participants enjoyed cocktails and dinner, dancing to the band Reflections music, door prizes and inspiring words of former Sen. Daryl Jones. Nearly everyone wonders about ancestry. To assist the workforce in researching genealogy, BEST offered the practical Roots family history workshop Feb. 20 at the Training Auditorium. Volunteers from Brevard Family History Center helped attendees identify ancestors, utilize census data and store family history. Participants also received free workbooks to guide their search. Titusvilles St. James A.M.E. Church opened its doors to KSCs community Feb. 23 for fellowship. Worshipers enjoyed Rev. Dennis Bells sermon and the African Children Choirs entertainment. KSC employee and parishioner Bill Gary shared his experience. I thought about how proud I was of my racial and cultural heritage and how that pride allows me to embrace and appreciate other races, said Gary. When we begin to know and understand our own history and culture, we cease being intimidated and fearful of others who are different. The visiting choir, which comprised 24 Uganda children from ages six to 12, inspired the congregation. I listened to the choirs opportunity to witness the cultural awareness and education I am afforded every month, not just February. Soul Food Fest, at KARS II Park, concluded event-packed February. BEST provided staples, while diners brought their soul food favorites to the Feb. 25 potluck. For $5 admission, 200 employees enjoyed fried chicken, black-eyed peas, casseroles, greens, cornbreads, endless desserts and some also won prizes. coordinator talk of the suffering many of the children endured due to war, diseases and starvation, said Gary. Many lost one or both parents to various calamities, yet they continue to persevere. Roslyn McKinney, also a parishioner and Center employee, described the services benefits. St. James tributes Black History regularly to educate and increase awareness. To share this experience with KSCs senior management and my coworkers was great. It was an Workers enjoy delicious food at the Soul Food Fest held Feb. 25. The event was one of several presented by Kennedy Space Centers Black Employee Strategy Team in celebration of African-American History Month. SPACEPORT NEWS March 7, 2003 Page 7Environmental and Energy Awareness Week April 21-23National Athletic Training Month activitiesAfter a chilly winter, electric bills have skyrocketed due to heating. Inevitably, hot days will soon be approaching though, and our thirsty lawns will be sighing for relief. Moments like these are when the message behind this years Environmental and Energy Awareness Week (EEAW) slogan becomes clear. According to slogan winner Mike Cressy, Kennedy Space Center = Kilowatts Saved Count. Interested in discovering economical, efficient, effective and Earth-friendly ways to remedy and prevent concerns like the examples mentioned above? If so, mark off April 21-23 on your calendar for EEAW. By attending the presentations, tours, exhibits and more, you will also simultaneously celebrate Earth Day! The program will travel around the Center to ensure all employees have easy access. EEAWs kickoff, April 21, takes place at the In March, the 30,000 members of the National Athletic Trainers Association (NATA) will celebrate the third annual National Athletic Training Month. At the national level, as well as in individual communities, certified athletic trainers (ATCs) will be hosting numerous special events and educational activities throughout March to increase public awareness about the athletic training profession. Mary Kirkland, a Bionetics employee and supervisor of KSC RehabWorks said, National Athletic Training Month was established so that the NATA could educate the public about our profession, and our quality and level of care. We want people to know that athletic trainers are integral members of any medical or athletic health care team, and work hand-in-hand with physicians and other allied health personnel throughout the healthcare continuum  from prevention and care to recovery and reconditioning and each point in between. Here at KSC, the staff of RehabWorks has something special planned each week for the employees.Kicking things off March 6 from 11a.m. to 1 p.m. in the Operations and Checkout Building (O&C) Mission Briefing Room will be Caring for the Youth Athlete. The staff will conduct 20-minute presentations on Injury Prevention, Weight Training and Conditioning, and Nutrition and Supplements. Geared towards the parents of youth athletes as well as youth coaches, this lecture series will educate them on how their children Training Auditorium starting at 10 a.m. The activities on April 22 will occur at the O&C parking lot. The final installment will take place April 23 at the VAB area Parking Lot E. The last two days both offer events from 9 a.m.  3 p.m. President/CEO of Audubon of Florida Dr. Stuart D. Strahl will be the guest speaker at the EEAW Opening Ceremony. Audubon ( www.audubonofflorida.org ) works to ensure that conservation becomes a common interest in Florida rather than continuing as a special interest. KSC workers continue their commitment to the KSC Guiding Principle of Environmental Leadership, but there is more we can do to conserve energy and protect our unique environment here at KSC, said Diane Callier, Environmental Programs Branch chief. We encourage all KSC staff to take time to come out to the EEAW exhibits, tours and presentations to learn more about Center environmental and energy activities and what they can do to support these activities. For additional information, contact Barbara Naylor at 867-8452 or Barbara.A.Naylor@nasa.gov, or visit http://environmental.ksc.nasa.gov/eeaw/eeaw2003/index.htm. can safely participate in sports and recreation programs while reducing their risk of injury due to conditioning or exercise.March 10 from 9 a.m. to 2 p.m. Athletic Training and Motorsports brings something exciting for all the race fans at Kennedy. Erik Nason, RehabWorks assistant athletic trainer, has invited his friends within the racing community to bring show cars, rescue vehicles and the Mobile Motor Sportsmedicine Center to KSC. Employees will have the opportunity to speak to Erik and the available support personnel on the numerous mechanical and medical support activities that take place on race day. Located in the east parking lot of the O&C, this day will showcase the use of athletic training within the world of Motorsports.For those who desire a more hands-on approach, March 20 is for you! A Prevention and Care of Musculoskeletal Injuries Clinic will be held from 11 a.m. to 1 p.m. in the O&C Mission Briefing Room. Six stations will be set up and manned by local athletic trainers to instruct employees on the following athletic training skills: 1) immediate care of injuries, 2) basic wound care, 3) wrapping and taping techniques, 4) heat illness and fluid replacement tips, 5) basic back and neck care, and 6) workstation design/microbreaks. All instructional materials will be provided along with handouts for the employee to take for their personal use.Wrapping up the month will be a health fair style event called the Athletic Training Expo. Held in the O&C Mission Briefing Room March 27 from 9 a.m. to 2 p.m., it will highlight vendors and exhibitors with the latest athletic training/ medical supply products, as well as health and wellness products and services. Door prizes will be given away, so come out and join in on the fun! As always, the staff of RehabWorks is available in the O&C to provide free rehabilitation for work and non-work injuries as well as most post-surgical cases. Call the RehabWorks staff at 867-7497 for more details on these exciting athletic training month events. Page 8 SPACEPORT NEWS March 7, 2003 John F. Kennedy Space Center Managing editor. . . . . . . . . . . . . . . . . . . Bruce Buckingham Editor. . . . . . . . . . . . . . . . . . . . . . . . . . Kathy Hagood Editorial support provided by InDyne Inc. Writers Group. NASA at KSC is located on the Internet at http://www.ksc.nasa.gov USGPO: 733-133/600026Spaceport News Spaceport News is an official publication of the Kennedy Space Center and is published on alternate Fridays by External Relations and Business Development in the interest of KSC civil service and contractor employees. Contributions are welcome and should be submitted two weeks before publication to the Media Services Branch, XAE-1. E-mail submissions can be sent to Katharine.Hagood-1@ksc.nasa.govFEW training program setThe Space Coast Chapter of Federally Employed Women (FEW ) will present its 24th Annual Training Program March 12, with a repeat presentation March 13. The event is to be held at the Cocoa Beach Holiday Inn. This years participants will hear from keynote speaker Fred Soto of Straight Talk Enterprises in Orlando, and workshop presenters William Eason, Buy a Car Without Getting Ripped Off; Joyce Duco, Taking Control of Your Life; Lawrence Gardner, Its a Jungle Out There; and Mary Kay Mueller, How to Feel Good and Stay Positive. The cost for this one-day seminar is just $79 per participant, parking is free, and FEW is providing a complimentary continental breakfast and lunch. For a registration form or to ask additional questions, contract Karin Biega at 867-6382, or e-mail Karin.K.Biega@nasa.gov or Vickie.C.Hall@nasa.gov.OSB II ribbon cutting held February 25Kennedy Space Center broke ground Feb. 25 on a new home for its Shuttle processing team, the Operations Support Building II (OSB II). The five-story, 189,000-square-foot complex will house more than 860 offices for NASA and contractor support staff involved directly in Shuttle operations. The new facility will replace modular housing constructed more than 20 years ago, buildings that have outlived their initial design life by more than 12 years. The structure was facing critical safety issues, due to the wooden support structures exposure to two decades of central Florida weather. The temporary structures were due for replacement, and got final go ahead through NASAs Safety and Health Initiative. If you are a little appalled looking at the outside, go in. It will literally take your breath away, joked Center Director Roy Bridges in reference to the old facilities. Mike Wetmore, director of Shuttle Processing, and Bill Pickavance, United Space Alliance vice president, also spoke at the groundbreaking, lauding NASAs determination in making the new facility a reality. The groundbreaking ceremony was attended by representatives of Governor Jeb Bush and members of Congress from the state of Florida. Phase I, the demolition of the current substandard office facilities, has already begun, with the second phase, building construction, to take place immediately after. The design of OSB II was awarded to Architect and Engineers Wolfberg, Alvarez and Partners of Coral Gables and construction will be completed by David Boland Inc. of Titusville. The $23 million structure is projected to be ready for workers in April 2005Above, Kennedy Space Center Director Roy Bridges Jr. addresses attendees Feb. 25 at the groundbreaking ceremony for the Operations Support Building II. At top, manager ceremonially shovel dirt at the site. Pictured from left are William Pickavance (United Space Alliance), Mike Wetmore (NASA), Miguel Morales (NASA), Mike Sumner (NASA), David Wolfberg (Architect and Engineers Wolfberg, Alvarez and Partners), Bridges, Don Minderman (NASA). Not pictured is David Boland, head of the construction company.